Think you know everything about felines? Think again! We bet these 11 cat facts have at least a few surprises in store for you! Cats are mysterious creatures, and if you think that you know everything about them, you’re sadly mistaken. Believe me, I’ve been a cat owner for more than 10 years, and my felines always find a way to surprise me. For example, I didn’t think it possible that Ronnie could climb the tree and perch on the highest, thinnest branch like an owl, but she did it. An interesting thing to learn at 5 am. in the morning. But I digress. Let’s see what the most surprising things that you don’t know about cats are. Related: 13 Funny Facts about cats. 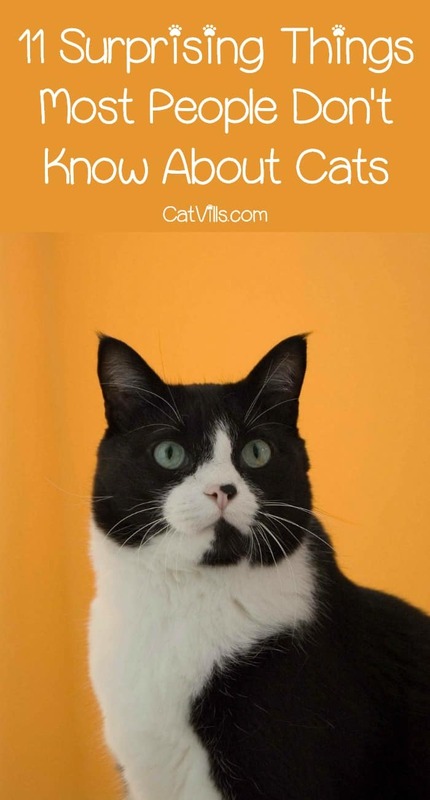 Do you know that the color of the coat can help you determine your cat’s gender? You just need to know two things. First, the magnificent calico and tortoiseshell cats are almost always female. That’s because the X chromosome carries the gene for coat color. A male cat with a tricolored coat always has mutated chromosome XXY chromosomes instead of the ordinary XY chromosomes. That’s why male calico cats are very rare and sterile. The second interesting thing is that male ginger cats outnumber female ginger cats. Since the gene for the orange color comes from the X chromosome, tomcats are either ginger or not. For females, it’s a bit more complicated. A female will be ginger when she has two X chromosomes carrying the ginger genes. The Egyptians had cat goddess called Bastet, also known as Bast. She was originally a warrior deity depicted as a lioness, but later took the appearance of or a woman with a cat head. Bast was regarded as a protector of the house, the one who keeps diseases and evil spirits away, especially from children and women. She was very popular in Ancient Egypt, and a lot of people worshipped her. Since all cats are sacred to Bastet, don’t anger your feline or you’ll suffer the ire of the goddess. Cats were sacred to the ancient Egyptians because they took care of mice, cobras, and other bothersome pests and kept them away from the crops. They were so important that people mummified cats after their death. In fact, archaeologists found 300,000 mummified cats when they excavated a temple of Bast, the cat goddess. Another interesting thing about this ancient society is that the family would often mourn the feline as a real person. And the punishment for killing a cat was death. You know how cats can twist in the air and land on their feet? This ability to orientate in the air is called a righting reflex. It appears when kittens are as young as three weeks and it’s fully developed by the time they are seven weeks old. Cats can do such seemingly impossible acrobatics because they have a unique skeleton – no collarbone and a flexible backbone. 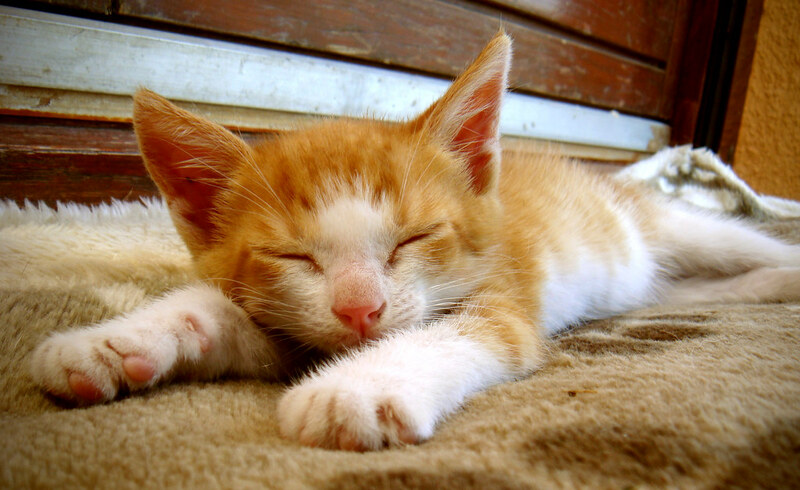 There is a good reason why your kitten sleeps so much during the first few months of his life. His body releases growth hormones only during nap time, so he needs his beauty sleep to grow big and strong. Older cats, on the other hand, sleep so much just because they can. However, they always keep one ear open in case someone opens the fridge or a tuna can. #6 Cats are officially evil?!! Cats were condemned as devil’s servants by Pope Innocent VIII. As a result, thousands of felines were killed. But this horrendous act wasn’t left unpunished. The rat population increased, and the Black Plague swept through Europe killing millions of people. Don’t mess with the cats. I’m going to disappoint you, but not all cats like catnip. In fact, around 30%-50% of the cat population doesn’t react to nepetalactone, the ingredient in catnip that makes felines go crazy. Moreover, the sensitivity to catnip is hereditary. I’m sure that you have noticed that sometimes kittens from one litter look nothing alike. That’s because kittens from one litter can have different fathers. Mama cat will mate with several tomcats during her heat cycle, and any one of they might fertilize her eggs. 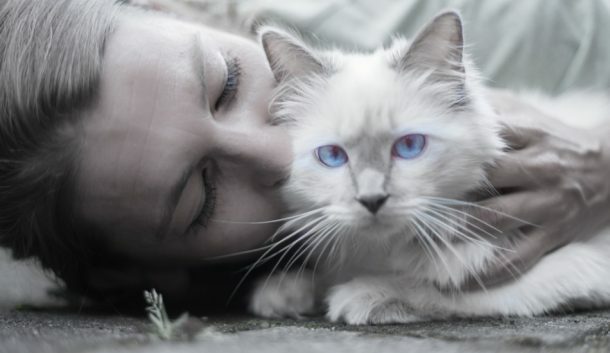 Have you ever wondered how cats purr? Well, you’re not the only one. Unfortunately, scientists can only speculate on the matter, but can’t give us a definite answer. However, we know that cats purr not only when they are happy and content, but also when they are injured and sick to soothe themselves and ease the pain. Cats also manipulate us by purring. When they are hungry, they use a special purring sound to make you get up immediately and feed them. This is called a “soliciting purr”. Kittens meow to tell their mothers that they are hungry, bored or scared, but adult cats don’t meow to communicate with other cats. They use body gestures and other vocal sounds to get their point across to the other cat. Adult cats meow only to humans to attract our attention. In other words, cats have learned that if they meow long and loud enough, they’ll get what they want. Most cats are lactose intolerant so drinking milk will cause tummy problems. Other forbidden foods include garlic, onions, and chocolate. But since cats can’t taste sweet, it’s not a big deal for them. So what do you think about these surprising facts about cats? Do you have anything to add? Then don’t be shy to leave us a comment. I don’t know much about cats and afraid to have one. These facts enlightens me about them now I know that they are harmless as I thought of they’re not. I was surprise that most cats are lactose intolerance as I have seen many people feeding them milk. Cats are one of my favourite animals so I loved reading this and learning more about them. Although I knew some of these some were new to me, I’m so shocked litters can have more than one dad! LOL. OK so most of these I did not know. We have two dogs but this was a great post to learn something new. These are so interesting! I read this with my mums cat sat next to me pawing my legs and being generally weird. I love cats and this information is not only interesting but also useful to me. I am planning to adopt a cat and I will be referring this article. Pinning it! I love cats. These are so interesting. I studied about the ancient Egyptians & their fascination with cats was really interesting. Well I have never know half of this. I now know about catnip and that their is a cat god! Wow!